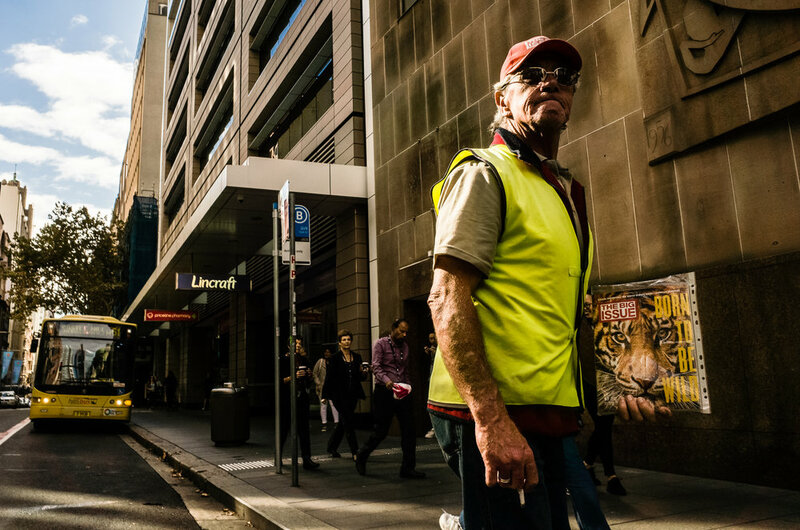 With that in mind, here are essentials six essentials to get started shooting street photography if you have never given it a try and are thinking of having a go. You should have access to some sort of camera. Obvious right? But many think that a street photography camera has to be some stealthy specialised bit of kit. There are indeed lots of great cameras that do actually make for fantastic street shooters. However, not having access to said cameras should not be a barrier to entry - it doesn't have to be small or stealthy or have a fixed lens or a zoom lens. You don't need the latest and greatest DSLR or mirrorless camera to shoot street. Just have something to make images with that you know how to use and are familiar with. That is all that is needed at the beginning. Really. There is nothing more to it than that. Use your phone, it is really a capable and powerful tool for street, and you can control exposure and focus points out of the box. Bonus, when you use your phone you can edit images and post them without even having to go to the trouble of getting your images onto a computer. There is something about shooting in the right kind of light that allows you to see more interesting things out in the world, and actually start shooting with intent. This usually lines up with the times of day when the sun is lower in the sky and there is more dimension, shape and definition to objects, buildings and people, where colours pop and shadows lengthen, and scenes of every day life take on an added dimension of interest. You might be constrained to only shoot in the middle fo the day, say in your lunch hour at midday, when the sky is right overhead. This means you have to hunt more for good or interestingly light, shadows, reflections etc. The shots are there, just keep looking. Find the right light and be ready to shoot. In street photography as a general rule people are the main subject of your photos. Therefore of course, you’ll want to go somewhere where there are people. I find however, going somewhere where there are just too many people makes it difficult to make an interesting photo. It is easier at the beginning to isolate subjects and find interesting elements that come together to make a story in the frame, and photographers are used to this idea of simplifying to make a better image. So use that principle and find somewhere busy, but not too busy. Of course you might circle back and start to find more interesting and dynamic compositions using layering of subjects and elements, and thats where a busy place might work. For starters though, make it easier and less stressful by keeping composition simpler. Too many people in the frame may make it harder to find a composition. It might be useful for you to gain more confidence in shooting out in the street by selecting a theme and using that to go out and look for photos. A theme gives you a purpose, lets you build up a story in your head about what you are doing, so it makes you relax about what others may think of you shooting. It also lets you build up a body of work that has a connecting theme, and gives you experience using those elements. It also provides a basis for building upon later. Themes could be colours, shapes, rules of photography, objects, subjects, really anything at all that you could possibly think of. Look through your current catalog of images and see if there is any pattern, or better yet one image that you really like and then go out into the street and try and find more of the same in different scenes. If you find it scary or confronting to go out and take photos of people on the street, take a different tack and start thinking about how to make pictures with people in the frame but not necessarily the main subject. You can do this with buildings, interesting shopfronts, cars, shadows etc etc. The person in the image is just another compositional element but not necessarily the main actor in the game. Shoot with intent and take time to fit all of the elements, including people, into the story you are trying to tell. Use people as just another compositional element. Street photography isn't easy. The best thing to do is to practice, practice, practice. Push through any creative blocks and just get used to seeing and shooting. Digital photography is a forgiving medium and a boon for the beginner, because it lets you try things, fail, learn and try again. I hope these quick tips on easing into street photography have helped you. If they have, or if you have any other suggestions that you have found useful, drop me a line in the comments below.